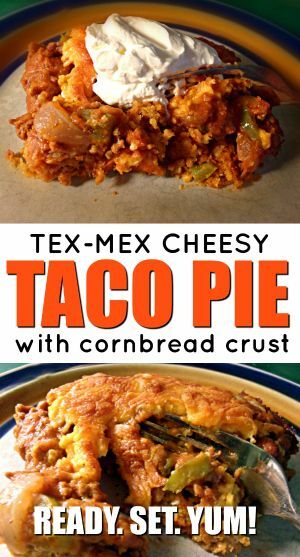 Tex Mex Cheesy Cornbread Taco Pie - Ready. Set. Yum! This is one of those fabulous meal in one’s that’s sure to please anyone who likes Tex-Mex food. 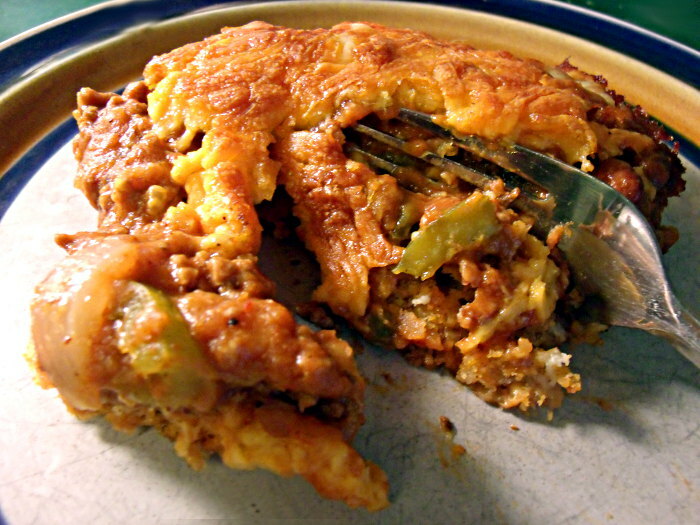 It has a cornbread crust piled high with cheese, beef, beans and more. 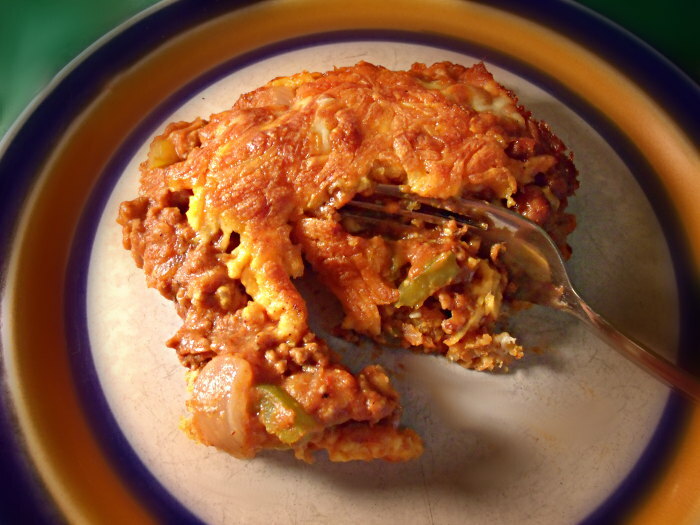 Very hearty and filling and perfect for fall. Start with 1 and 3/4 cups of cornbread mix. Some people prefer the sweeter brands like Jiffy, but I prefer Martha White. It’s up to you. They aren’t that much different. 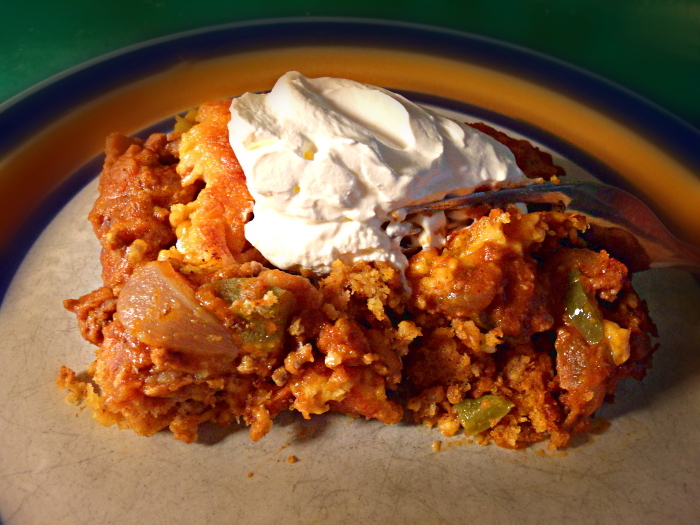 If you like sweeter cornbread, go with Jiffy. Preheat oven to 400. Combine the cornmeal mix with 1 egg, 1 package of dry taco seasoning mix, 1 cup of crushed corn chips, and 1 cup of cream style corn. 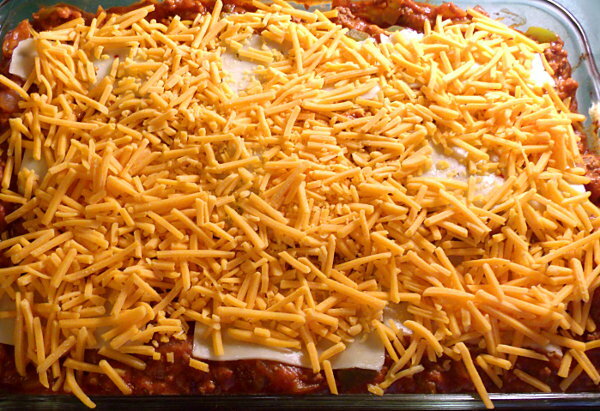 Mix it all up and pour into a greased 13×9 or 13×11 inch casserole dish. Bake for 20 minutes. While the cornbread crust is baking, start browning 1 and 1/2 pounds of ground beef. Use a large pot or large frying pan. When the beef is about halfway done, add in one chopped onion and one chopped bell pepper. When the beef is cooked through add a package of taco seasoning mix , 1/4 teaspoon of salt, 1 teaspoon of garlic powder, one 16 oz can of refried beans, and one 8 0z jar of enchilada sauce. Cover and simmer on medium heat for about 10 more minutes. Sprinkle a cup and a half of shredded cheddar jack cheese over the top of the cornbread crust. Add a layer of crushed corn chips. Pour the meat mixture and spread it over the corn chips. On top of the meat, spread another cup and a half of cheddar jack cheese and it is ready for the oven. Bake at 375 degrees for 45 minutes. In the picture below I had to use sliced jack cheese instead of shredded and it worked out just fine. Remove from oven and let rest for 10-15 minutes then serve. Garnish with sour cream. Or not! Either way it is delicious! 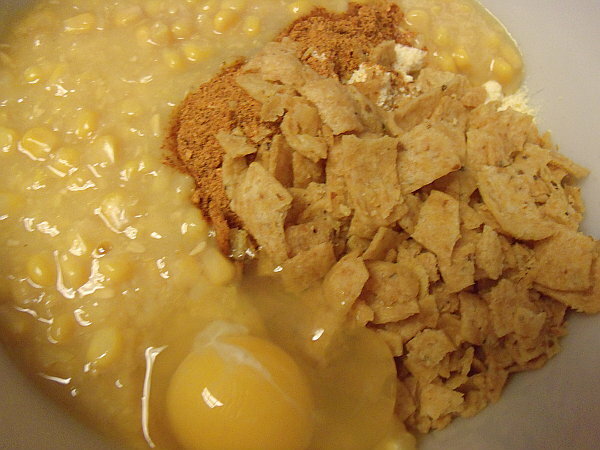 Mix together dry ingredients, then add egg and creamed corn. Stir until completely blended. 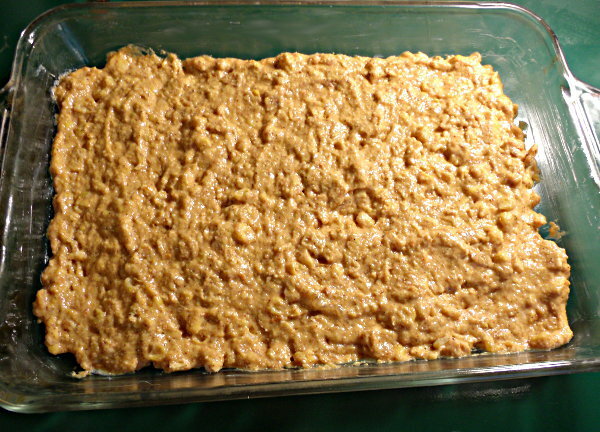 Pour into greased 13x9 or 13x11 inch casserole or baking dish. 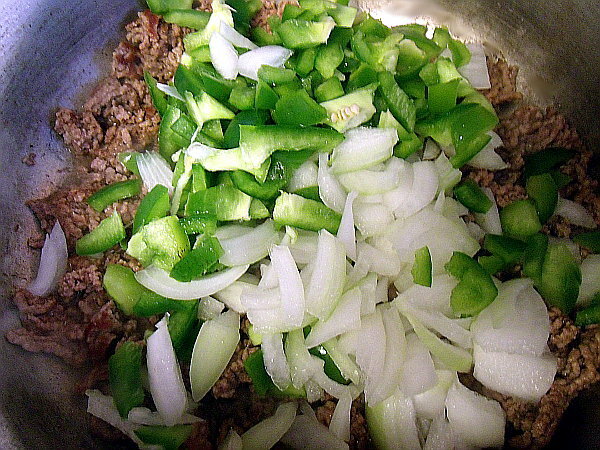 Brown ground beef and when it begins to lose it's color, add in onion and pepper. Cover and simmer on medium heat for an additional 10 mins. 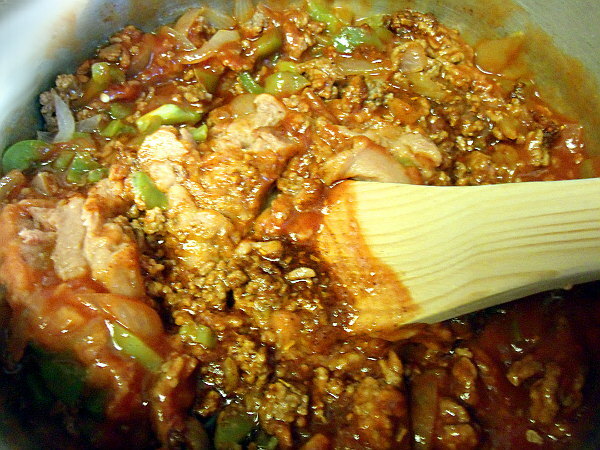 Add taco seasoning mix, garlic powder, salt, enchilada sauce, and refried beans, and stir until completely blended. Spread half of the cheese mixture over the waiting cornbread crust, then 1 cup of crushed corn chips. Pour meat mixture over the corn chips. Spread evenly. Scatter remaining shredded cheese over the mixture. Put into oven and bake for 45 minutes. When done, remove from heat and let rest for at least ten minutes before serving. Garnish with sour cream or salsa or your favorite Tex-Mex topping!